Soup or salad. Salt or pepper. Pizza or more pizza? These are decisions we face everyday, and these decisions never get easier. The event display world is no different. 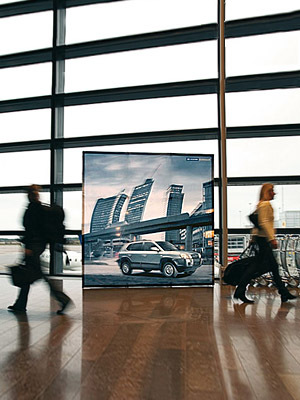 Finding the perfect display solution to complement your specific campaign is critical! Where should I put my message? What type of event will the product be used at? How visible do I want to be? What should I put my message on? Should I add pizza or more pizza to my brand? Well, I have two answers for you: Never make decisions while you’re hungry, and always go with Expand! Here are a few broad event campaign scenarios, with some Expand solutions to yield the best results for your brand. The sun is out! People have retired their jackets for tank tops and flip-flops. This is a perfect time to put your brand directly in peoples hands. Sometimes you have a lot of space to make a great impact. You can set up an Expand VenueTent and couple of the Expand FlagStand XL‘s. These outdoor solutions are perfect for attracting sun worshipers from all over your space, and with the Expand VenueTent you can offer a relaxing meeting place for consumer interactions as well as staff. For activations in busy streets, space is a huge concern. You want your message to be seen, but you don’t want to get in people’s way. Think about the number of people expected to visit the location at a given time when developing the footprint design. If information is being exchanged, you need people need to check in for data collection, or you are promoting a product the Expand PodiumCase would be the way to go. Add the finishing touch by flanking the central structure with eye-catching graphics and messaging on the Expand MediaScreen 2 Outdoor and/or an Expand FlagStand 1 to complete your picture nicely. Everybody has known for a while that experiential marketing has been the largest growing branch of the industry. In this digital age, ‘tweets’ and ‘likes’ are currency. You want you activation to go viral! Whether you are planning a pop-up store, a quick activation in a public building, or branding a whole space we are always worried about making a memorable, engrossing experience. This is easier said than done. Construction, and transportation can be time consuming and expensive. But fear not, Expand has you covered. The Expand 2000 and Expand MediaFabric are two inventive ways to cut those costs but not cut your vision! Expands wall displays are impressive in size, quick and easy to install, and creates that extra impact you need! Take all the risk out of your brand experience, and check out Expand’s messaging enhancements! Exhibit halls can be packed and daunting. A senses overload! But you’re here and you scream, “I am Marketer…hear me roar!” That could be one way of marketing yourself, but maybe not the most effective. Whether it’s your first time or you’re a seasoned pro, you have to get your name out there…in the right way. For larger events in large spaces you want to stand out from the group. The Expand LinkWall gives you a flexible, dynamic option. The Link Wall helps by leveraging a series of curved or straight wall structures that can provide a nice backdrop/booth with large graphics to get your message across to attendees. Tie in the Expand QuickScreen 3, graphic carpet, monitor holder and tablet holder to give your space an immersive look. If you are looking for the highest visual impact for your booth or display look to the Expand InfinitaSystem. The beauty and elegance of this product is its ability to use the same mounted frame and exchange your graphic at a moments notice making your space an enticing showcase for floor walkers. I hope this gives you some ideas while you plan your next event. Share your designs, activations, and floorplans with us on twitter #ExpandUS, Facebook, and LinkedIn. We’d love to see what you made!